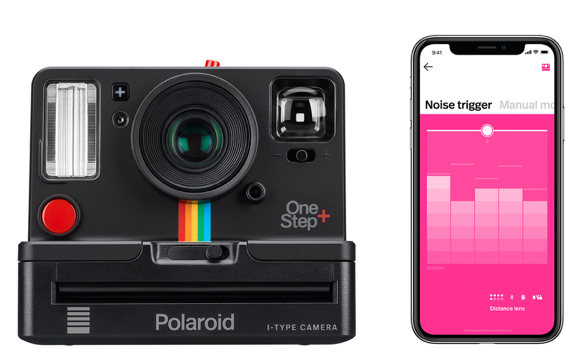 At IFA 2018 Polaroid Originals announced the OneStep+, an analogue instant camera with an integrated smartphone app. Polaroid claims the new instant camera offers more ways to play with analogue instant photography, unlocking a world of creative tools and techniques with a Bluetooth-connected smartphone app. The Polaroid OneStep+ is a natural evolution of the OneStep 2, claims Polaroid, introducing new features to the camera’s nostalgic design to bring more creative potential to instant photography. First up, a new portrait lens complements the camera’s standard lens, allowing users to to shoot from as close as 1ft away. In 2017, Polaroid marked its 80th anniversary by returning to original format analogue instant photography with the launch of Polaroid Originals and the unveiling of the Polaroid OneStep 2 camera. Now, Polaroid Originals offers more ways to explore, create and play with the release of its new camera, the Polaroid OneStep+. Polaroid created instant photography as we know it today with the launch of the breakthrough Polaroid SX-70 camera in 1972, followed by landmark innovations such as the original OneStep, colour instant film, and the Polaroid 600 and Spectra cameras and film formats. Artists who used and were inspired by these cameras, including Andy Warhol, Helmut Newton, Robert Mapplethorpe, Keith Haring and Guy Bourdin.